Another in our ongoing series of reviews of cigars given to us by the good folks at Cigars Direct. Featured this time is the Avo Signature Belicoso which we received back in May of this year. 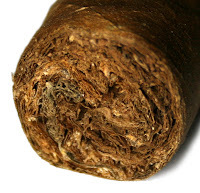 Produced by OK Cigar Corp., it features a gorgeous Ecuadorian wrapper and a straight forward torpedo shape. The current Cigar Aficionado rating for it is 88 (Aug, 2007). Following Cigar Aficionado's 4-part rating system (Appearance & Construction, Flavor, Smoking Characteristics, and Overall Impression) I sat down to rate this cigar while enjoying a glass of summer ale. Though obviously well-made, my cigar had a crack running upwards from the foot about 3/4 of an inch. The draw was pretty good, as was the amount of smoke produced. The burn got slightly uneven, but never out-of-hand. Flavors started out a little woody & dry, but warmed to a nice sweetness, before it began to spice up a bit in the second half. My rating for the Avo Signature Belicoso is 84. A very good cigar. As you can see by the overall impression score, this cigar was actually quite enjoyable despite some of the cosmetic or performance shortcomings of this particular stick and I look forward to more of these wonderful cigars. Thanks again to Cigars Direct for allowing me to try this very high quality cigar! © 2009 The Cohiba Club - All rights reserved. Hi, as you may already discovered I'm fresh here. We appreciate you visiting our blog.